This is what rock bottom looks like. 1955's Abbott and Costello Meet the Mummy is the end of the line for several things. Yes, it's the final movie to star the iconic Mummy until 1999, over three decades later. 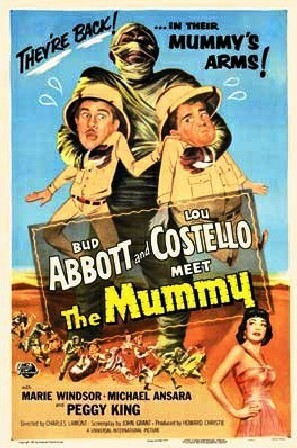 But it's also the final movie from Abbott and Costello to be made by Universal. In fact, it was pretty much the end of Abbott and Costello as a movie duo, with them only starring together once more the following year. For those who are interested in such things, this is technically their 28th motion picture for Universal, and it had been a long and profitable partnership in its heyday. Watching earlier Abbot and Costello films is usually a really fun and rewarding experience; their gags are often laugh-out-loud funny, and they had an interplay that made them household names. By the time we get to this movie, though, the magic is nearly gone. 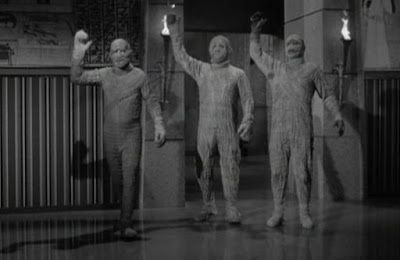 It's telling that The Mummy is their final monster encounter, after previously working their way through the Universal Monsters rogues gallery of Frankenstein, The Invisible Man, and Dr. Jekyll and Mr. Hyde. By the time they ended up here, there were virtually no monsters in Universal's stable besides The Mummy. One can't help but feel like this was everyone's last choice. The movie consists mostly of bits between Bud Abbott and Lou Costello, and some of them work better than others. There's the hamburger bit, the hide-and-seek-with-a-dead-body bit, the snake charmer bit, the water in the face bit, and so on. The comedy that once felt fresh and fun now feels very tired. But I can't stress this enough: if you are unfamiliar with the comedy of Abbott and Costello, don't judge them on this effort. They'd been making movies for Universal for 15 years, and had been radio stars before that. When they first hit the scene, they were outstanding, and they proceeded to have a long, prosperous comedy career that made them icons and household names. Nothing lasts forever, though, and all good things must eventually come to and end. This is pretty much that end. Newer comedy teams like Dean Martin and Jerry Lewis were arriving, and the torch had to be passed. The exact same thing could be said about The Mummy himself. Speaking of The Mummy, where does he fit into all of this, you ask? Good question. He really doesn't. The Mummy feels like an afterthought to a bunch of Abbott and Costello bits set in Egypt. We see a glimpse of him in his sarcophagus early in the movie, but he doesn't actually get out of the thing until almost an hour into an eighty-minute movie. When he finally does start roaming around, we see that the legendary costume and mask from special effects makeup artist Jack Pierce is gone and has been replaced by, get this, a jumpsuit. The Mummy, here renamed Klaris instead of Kharis, drags himself around in a baggy bandage jumpsuit with a saggy bottom like he has a dirty diaper. What's more, they build gags around The Mummy and have other people in similar jumpsuits, meaning that there are scenes with THREE Mummies with dirty diaper bottoms. For fans of horror and the rich legacy of Universal Monsters, this is a travesty. 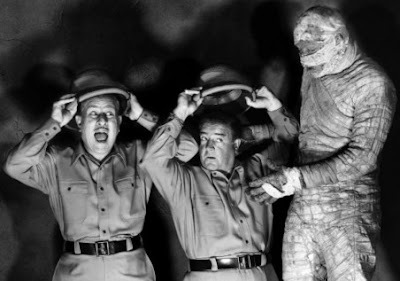 Not only does it cheapen the impact of what has come before by making the monster himself the subject of comedy (something earlier Abbott and Costello monster movies avoided), but it pretty much ruins The Mummy. There's a reason it took thirty years to get a decent Mummy movie out of Universal after this, and it's because they had absolutely devalued the character through multiple sequels of diminishing quality followed by this, an absolute mockery of the concept. This would be like putting Jason Voorhees on Hollywood Squares. It would ruin what makes him scary and special. Freddy Krueger would be right at home as the secret square because it fits with his character, but Jason? No way, Jose. He belongs to the night, a killer in the shadows (notice how I've avoided bringing up that time that Jason Voorhees was on The Arsenio Hall Show). Some characters need to stay in the shadows. I've seen most of these Mummy movies before, but I've never really sat down and watched them consecutively with the intent of tracing through-lines and seeing how they work as a series. Now that I'm six films deep, it's becoming obvious that there has never really been a solid legacy for The Mummy. The first film is a classic, but each sequel fails to live up to the quality of that first film or the potential of the story itself. In a lot of ways, it reveals that The Mummy has always been a the red-headed step-child of the Univeral Monsters. He has an iconic image that is instantly recognizable and he's helped sell model kits and makeup kits and magazines, but he's never shared the same status as monsters like Dracula, Frankenstein, or Wolf Man. When you think of The Mummy, you think of classic black and white horror, of the undead corpse dragging his leg through the night on his way to kill. Yet that was rarely the image we saw on screen. The impact of the Hammer Films approach to the character must be taken into account, but The Mummy of our pop culture seems to be largely a myth, something that never existed on screen as it does in our minds. This is somehow very sad to me. This movie is, for me, the lowest point in the legacy of an icon. Given that it's also the end of the Universal adventures of Abbott and Costello, I came away from this movie pretty bummed out. Of course, my perspective has been skewed by watching all of the movies essentially back to back. I have to realize the value of comedy and introducing the character to kids in a way that isn't frightening, so the movie has value for that, if nothing else. And it's not this film's fault that I decided to marathon the Mummy flicks. One can't deny that the approach used in this movie is different than in other Abbott and Costello comedies, but maybe it's all for the best. Just as with the most successful scary movie icons, what starts as a pure vision of dramatic horror eventually ends up on a lunchbox. Judged by that metric, The Mummy may be one of the most successful monsters of all.